Finally after waiting patiently for several months, the Toys R Us exclusive Mr. McMahon figure has arrived, coinciding with his return to WWE programming. The figure was only available by mail-away order, requiring the UPC codes from four WWE figures (Elite, Legends or Defining Moments) along with the receipts, a completed order form and five bucks for shipping & handling. This is Mattel's first attempt at a Vince McMahon figure, so let's jump in and see how he turned out! The packaging is a modified version of what we've seen from the Basic series in 2011. It follows the familiar hourglass shaped bubble glued on to the card. The overall all package is slimmer than the Basics packaging. There is no indication of which specific line McMahon is part of, although the figure is clearly in deluxe articulation category. Aside from his name appearing on the insert, there's an "only at Toys R Us" sticker on the outside of the bubble. 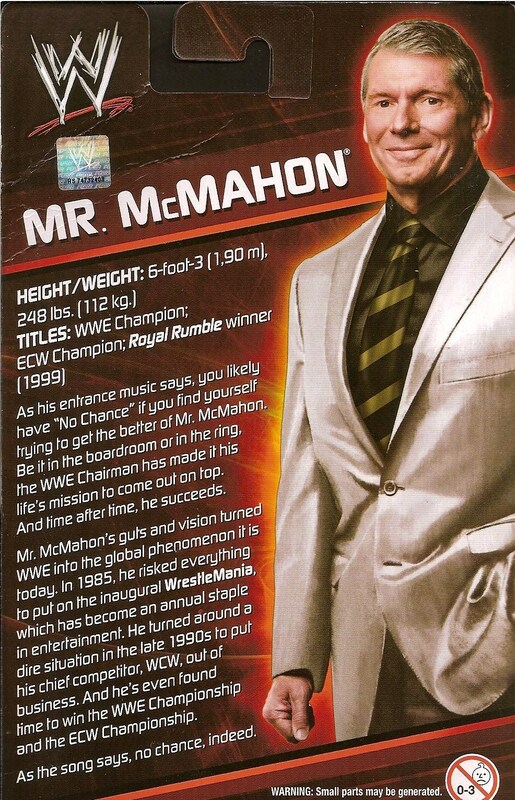 The back of the card is much more inline with the "Elite" and "Legends" packages, having some biographical information on McMahon. Mattel's giving us a nearly 100% new sculpt here (I'm pretty sure the hands are reused) and it looks fantastic. But there is one huge problem not immediately noticeable while the figure is in the package. He's too tall! The figure makes McMahon look like a giant compared to other Superstars roughly the same height. Vince is listed as being 6'3" tall on the package bio, so his figure should be about as tall as Stone Cold's (Austin is listed at 6'2"). This figure can look across the top of SCSA's head when both are face-to-face. Let's look past McMahon's height and focus on the sculpt. There's a good likeness to the head sculpt, but I'm not sure what the design team was going for with his expression. He's not smiling like he is in the photo and he's not delivering "angry McMahon", either. No, he's stuck in a "eh, I'm not impressed" type of expression. It's not a bad look, just a bit confusing. Also, my figure is a bit cross-eyed. I think the problem is with his left pupil, it's painted a little lower than the right one. His hair is sculpted combed to the side like he's been wearing it for the past few years. Mattel did a good job matching his hair color and added lighter gray highlights for that "distinguished" look. The suit is completely sculpted on the figure except for the separate jacket piece over the torso. It features two sculpted buttons, but is actually held down by peg on the front. Unfortunately it's glued shut so it would be difficult to remove without tearing or cutting the jacket. His tie is a sperate piece that hangs below the peg on the jacket and features nice clean stripes painted down its length. McMahon's upper torso and shoes are molded in black while his arms, lower torso and legs are molded in the grey color of his suit. They did a decent job of matching the paint on his neck with the flesh color his head and hands are molded in. The "inside" of each sleeve is painted black to match his shirt and while his belt is also painted black, it doesn't extend all the way around, just the front half of his waist. Not that it needed to be, since due to the non removable jacket, you won't really see the belt on the back. The belt buckle is painted in silver. The figure's articulation is what tells you which line he belongs in. He's an Elite figure all the way. Take special note of the hip joint in the diagram. McMahon's the first Elite-styled figure to include a swivel/hinge instead of the standard ball joint. Fans of Mattel's other "Adult Collector" figures will recognize this configuration immediately. They will then curse Mattel because the joint has never worked better than it does on Vince. Instead of the sometimes often times gummy hips seen on DCUC figures, McMahon's use hard plastic to deliver a solid base for the moving parts. This set-up doesn't work well for wrestling figures because of their ring attire, but since McMahon's in a business suit, the work just fine for him. The ankle joints work identically to Defining Moments Austin, with a barbell that moves like a ball joint inside the lower leg and features the "rocker" joint in the foot. Most of his points move well with only his torso and hips obstructed by the jacket, however the jacket is very flexible and being only "buttoned" at the top, allows for significant range in the legs. McMahon can actually raise his legs 90 degrees at the hips! The same can't be said about his elbows, which barely reach 75 degrees. There are no accessories included with VinnieMac, which is to be expected with a mail-away promo figure. The only problem I have with the figure is the height. It's just way off and it's kind of aggravating. I truly appreciate Mattel's effort in creating "Superstar Scale", but that doesn't mean they hit every figure on the button and it throws your display off when you have an average-sized Superstar towering over other figures. The plus side is that this was a "free" figure, so who cares, right?! Okay, sure, I had to buy four $16.00-plus figures and jump through hoops to order him, but still, I didn't buy anything I wasn't already going to buy (probably) and it's Vince McMahon. The chairman of the WWE. The man who created WrestleMania, for crying out loud! No point in letting the oppurtunity pass you by. While I don't think we'll need another business suit Vince figure, this sculpt can easily be reused for other figures, most notably McMahon's own son-in-law, Triple H. They just need to create shorter lower leg pieces first. Come back tomorrow for a very special contest announcement! And who knows, maybe YOU can win your very own Vince McMahon action figure!